On UN World Food Day, October 16, we took some time to review the UN Food & Agriculture Organization’s (UNFAO’s) latest report on food insecurity: The State of Food Insecurity in the World. The good news is that the number of undernourished people in the world has fallen by 17 per cent since 1990-92. Between 2011 and 2013, 26 million fewer people went hungry than in the previous three years. However, statistics don’t tell the full story when it comes to the challenges facing the rural poor, women and children at getting access to adequate nutrition in many areas of the world. While the UN and others acknowledge that food security programs such as those you make possible through Canadian Feed The Children are an important contributor to the overall decline in poverty and hunger, the reality is that progress is slow. The 2008 global economic downturn, combined with drought and famine in Eastern Africa in 2011, has meant a slow road back from gains made in the early 2000s. Still today, one in eight people (842 million), is estimated to suffer from chronic hunger and regularly not get enough food to conduct an active life. More than three million children under age five die of poor nutrition each year. The UNFAO report underscores what it – and CFTC – recognize as realities in the complex world of poverty and hunger alleviation: progress is uneven; and high-level statistics belie the complexity of the issues. For still too many, particularly those in sub-Saharan African, getting access to adequate nutrition is as difficult today as ever. Continued, stepped-up support is required if many of the world’s most impoverished nations are to meet their goal of halving poverty and hunger by the target date of 2015. But that support needs to be focused on high-value, sustainable strategies that can truly drive change by addressing poverty and its root causes – and by targeting those who continue to bear the greatest brunt of its effects: women, children and the rural poor. The broader suite of indicators used by the UN aims to capture a more nuanced picture of food security to guide initiatives that can meaningfully contribute to the eradication of hunger, food insecurity and malnutrition. Similarly, at CFTC, we’ve been on a ‘journey of transformation’ for the past several years to bring in deeper, more focused and longer-term approach to our mission to reduce the impact of poverty on children and their families in the communities in which we work. Here’s a look at CFTC’s own activities and strategies as they line up with the latest UN findings. Focus on the rural poor, especially women. Increasingly in the last several years, CFTC has been supporting micro-finance programs such as Self-Help Groups and Village Savings and Loans Associations. These strategies are community-based and community-led, bringing not only new capital in the form of small loans to individual participants and to groups in the community, but also creating opportunities for skills development and better livelihoods – especially for women and their families. 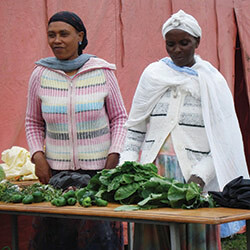 Asrat Tola, a mother of three and Self-Help Group beneficiary in Chancho Township, Ethiopia has benefitted from income-generation programs run by CFTC’s local partner, ISAPSO. She’s received basic business skill training, financial management and leadership training, which has led to an improved standard of living for her and her family. “Asrat is a great example of ‘the multiplier effect.’ When we visited, her urban garden covered every square inch of her backyard. In her first year, she raised enough money selling her produce to buy chickens, then sold chickens to buy sheep, and has now sold them to grow a thriving vegetable and livestock business and support her family,” said Heather Johnston, Director of Programs at CFTC. Similar groups also exist in Uganda, where they called Village Savings and Loans Associations (VSLAs). 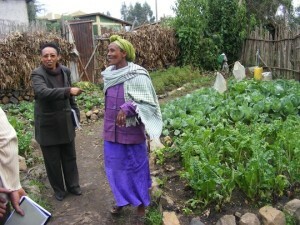 As in Ethiopia, these groups are focused on core, sustainable, community-based development – not charity. The VSLAs run by CFTC partners in both rural and urban areas of Uganda have brought hope and help to women who face some of life’s most difficult circumstances: burdened by poverty, often left as the single breadwinner, with their own children and others to care for and with few resources to provide even the basics for themselves or their families. Gertrude Namili is one such woman. She’s a beneficiary of CFTC partner HUYSLINCI’s unique VSLA, which uses a vocational training and “trade-it-forward” approach to support small groups of women. The concept is simple: women are selected to attend training sessions where they learn the skills to manage a small, usually livestock-based, home business. When trainees graduate, they receive a number of animals (in Gertrude’s case, pigs). They breed their animals and return one of the offspring to the next year’s graduating group. 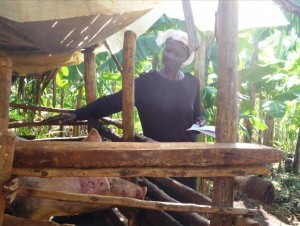 Within the context of their group – which provides social support along with economic and skills development – and the trained community agricultural workers who provide regular monitoring, animal care and business/marketing advice, women like Gertrude are taking great strides out of poverty. In many cases, they are using their newfound confidence and skills to inspire others – becoming community workers themselves, and establishing new VSLAs to extend their benefits even further. Increase agricultural productivity and food availability for smallholder farmers. As the report explains, gains are not consistent – even within a country that has made significant overall improvement. CFTC and its generous donors, through a grant from the government of Canada, has for the past year been slowly but steadily improving the lives of smallholder farmers in Ghana’s agriculture-dependent, rural north. Our mid-term report on CHANGE (Climate Change Adaptation in Northern Ghana Enhanced) outlines the great progress made in just under a year. This progress is part of a longer-term strategy that CFTC has been supporting in northern Ghana since the late 90s, in particular to address the UN’s follow-up point. Create opportunities for community-led economic development and sustainable livelihoods. This is precisely the strategy used by TradeAID Integrated, CFTC’s partner in the Upper East Region of Ghana. TradeAID – similar to ISAPSO in Ethiopia and HUYSLINCI in Uganda – focuses on rural women, in particular, to build their capacity for sustainable agricultural and non-agricultural income generation. Implement integrated solutions that improve nutrition. CFTC knows that the end goal – a reduction in the world’s hungry, and better lives for the world’s most impoverished people – can only come about within a web of other supports. There is no Band-Aid, quick-fix solution to move the number from one in seven to one in eight … or to one in a million. Where the web is torn, or where it doesn’t reach, we still need to provide immediate, remedial attention – such as school feeding and high-nutrient food supplementation. As we do so, we need to redouble our efforts to maintain and grow the longer-term, foundational strategies: support for income generation, agricultural production, skills development, greater access to quality education, and proper hygiene, water and sanitation. All, working together, are critical to nourish children’s physical, cognitive and social development in the early years, unleash their potential, and break the cycle of poverty. Holistic and integrated programs, built on the premise of sustainability and implemented by and for the communities themselves, create a framework for the kind of long-term improvements that the UN FAO measures and reports on a rolling three-year basis – the numbers that grab the headlines when they are released.